On Saturday I trotted along to the food blogger get-together organised by Duncan, Sarah and Thanh in the back courtyard at The Commoner in Fitzroy. I had originally been thinking of bringing a couscous salad, but at the last minute decided to make little buttery passionfruit biscuits instead. There was a tense moment on Saturday morning where I had to run back to rescue the shopping bag containing the passionfruits from where I'd left it on the tram (oh, and last-minute HIGHWAY BLOODY ROBBERY at Coles, $2 per passionfruit, grrrrrrr), but I managed to whip 'em up in time to get to The Commoner by 2pm. I think they're pretty damn tasty myself (it's the icing that does it) - if you're interested, the recipe is in the Women's Weekly Big Book of Beautiful Biscuits. Ed somehow finagled a fabulous collection of cheeses donated to the food bloggers by the Big Cheese himself, Will Studd. Outrageous lashings of cheese, topped with smashed fresh figs supplied from Joel's tree were happily consumed, and leftovers were brought home. I also really liked the Flammkuchen prepared by Sarah and Sandra and cooked in The Commoner's wood-fired oven. 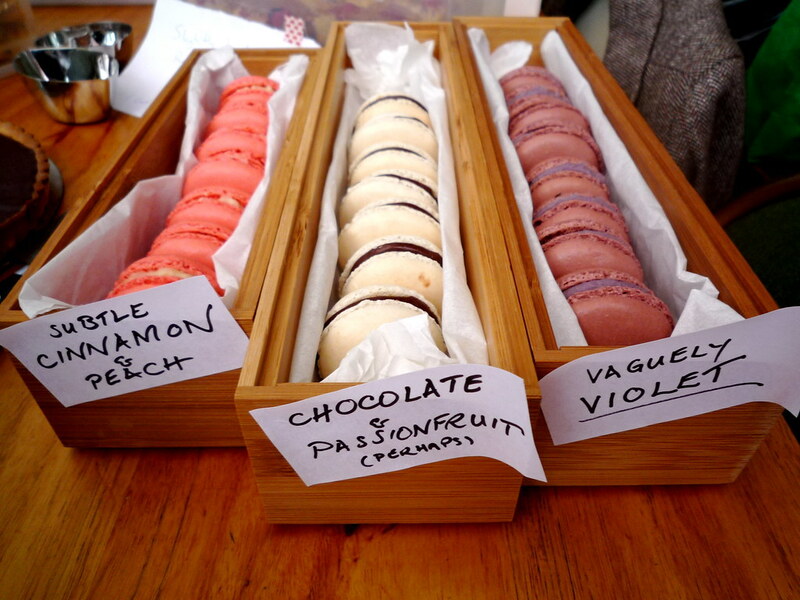 Melbourne's Macaron Maestro Duncan somehow managed to outdo his previous contributions to food blogger gatherings, this time bringing THREE fantastic flavours of macarons. I think my favourite was the subtle cinnamon and peach, followed closely by the violet, then the chocolate/passionfruit. 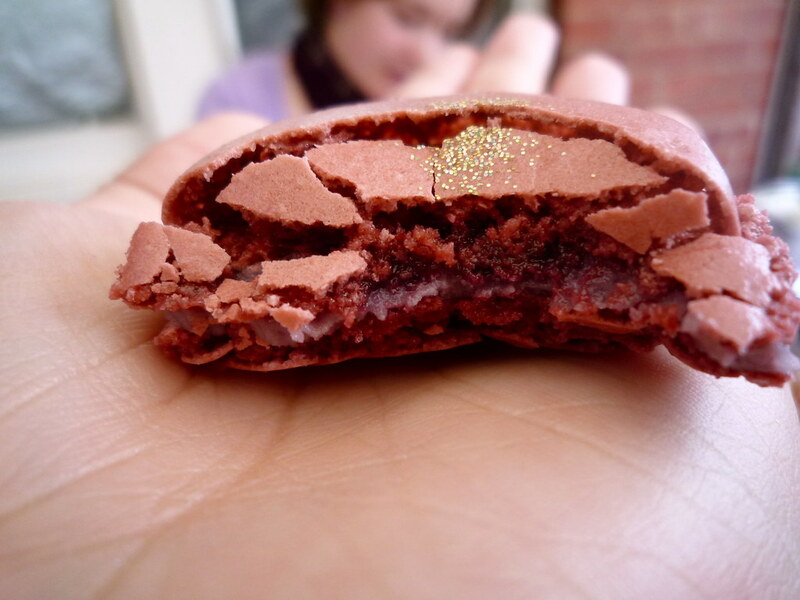 Check out the edible sparkles! 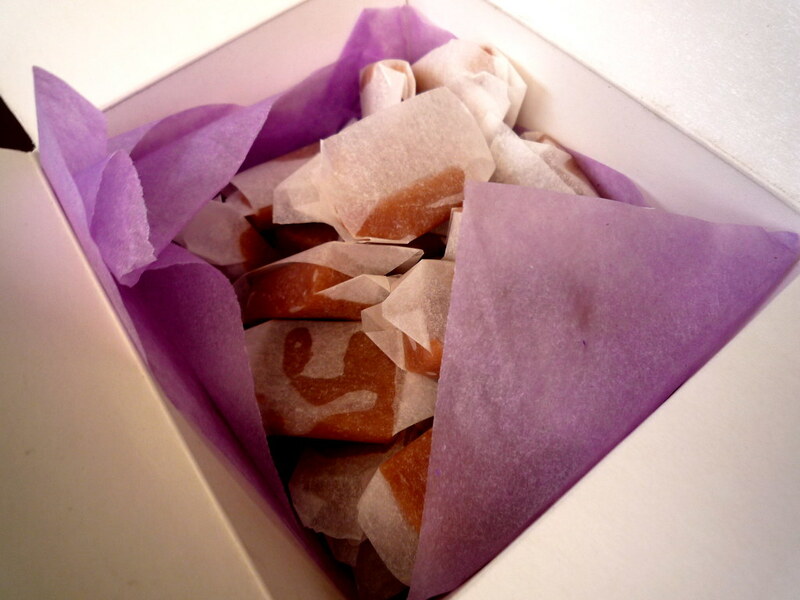 I also loved these individually wrapped salted caramels made by Asti. There were heaps of these so we each grabbed a small handful at the end - they made great movie munchies this afternoon at the French Film Festival. And speaking of salted caramel, it would indeed be remiss of me to not mention the SENSATIONAL salted caramel and dark chocolate tart prepared by Jess. It pains me to say that I don't have a photo of it on my camera, but let me just say it was so good that I forewent other sweets so that I could have another slice of the tart. That's how good it was. The recipe is here and I intend to attempt it next time I host a halfway fancy dinner party. It was lovely to see lots of familiar faces from previous gatherings and to meet some newbies. The resulting cheese/sugar coma was totally worth it. A big thanks to D, S and T for organising and to The Commoner for hosting us! 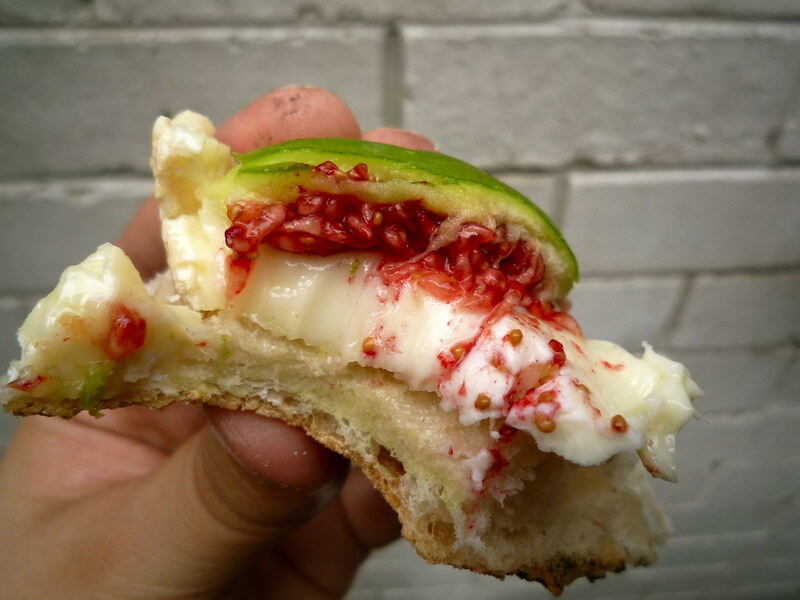 Beautiful photos, especially of the figs and cheese in that bite. Oh, so sad to have missed the gathering, I STILL haven't managed to attend any. Nevermind, I spent my first weekend at home in 3 weeks and enjoyed pottering in the kitchen with a new lasagne recipe. I missed this too! I was so looking forward to going to my FIRST food bloggers event, and I had to be interstate instead. 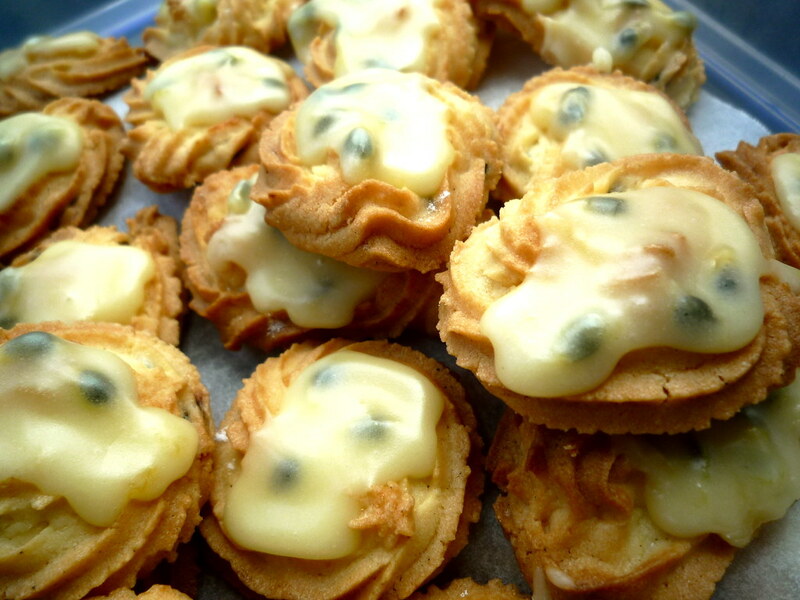 To miss out on cheese, macaroons, passionfruit bikkies and the rest, its too hard to take. 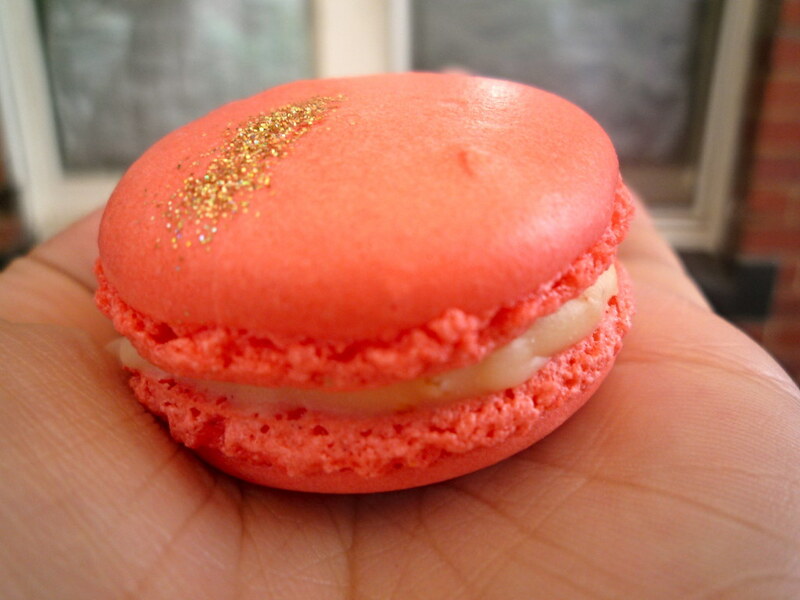 Lovely macarons! 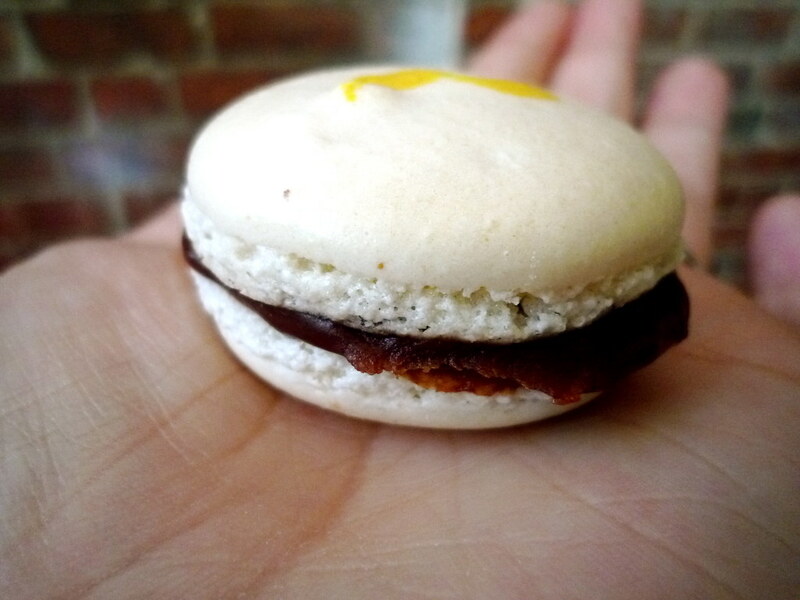 We hardly can find macarons here!